The happiest day of your life is apparently often also the most expensive day of your life. 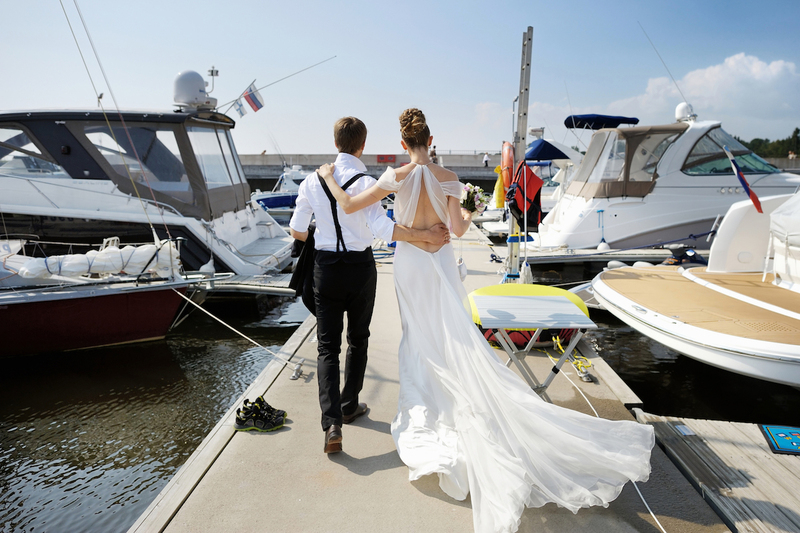 Whether you’re celebrating with DIY “I do”s or a lavish, billion-dollar blowout (yes, we’re serious), your dream wedding’s costs can add up quickly. The national average cost of a wedding in 2016 was $35,329, according to The Knot’s 2016 Real Weddings Study. And that doesn’t even include the honeymoon. Clocking in at an average of $16,107, the venue is definitely the biggest expense most couples shell out for on their wedding day. But that number definitely doesn’t have to be so high! If you’re looking to save some big bucks on your upcoming wedding, try one of these nine inexpensive wedding venues that can help you save big. Or, consider doing what this couple did: They combined their honeymoon with eight different wedding ceremonies in cities around the world. The Knot reports the average wedding crowd consists of about 141 people and that catering costs an average of $71 per person. That’s 141 times $71, or about $10,011 for food and drinks for the big day (not including the cake, which will run you, on average, $582). But you can save big on food, too. Check out these seven ways to save money on your wedding day, and consider letting food truck fare be the main course. Or read up on how to cut the cake’s cost by going the alternative dessert route (think: cookies, cupcakes, even doughnuts!). At an average $6,163, the engagement ring is the third priciest piece of the wedding puzzle. But if you or your partner aren’t too keen on wearing six months of rent money as everyday jewelry, check out these engagement ring alternatives to help you save big — without compromising on style. If you love the traditional engagement ring idea, though, at least make sure you understand the basic ins-and-outs of buying an engagement ring without going broke. With the average wedding dress going for about $1,564, this is an obvious place to cut costs — especially considering you’ll only ever wear it once! Check out these tips for finding your dream wedding dress on a budget, or do what most people would deem crazy (although it’s really not if you think about it): Sell your wedding dress after the ceremony to recoup some of the cost. Are Flowers and Wedding Photographers Worth It? These are the only two things I’ve ever thought to be non-negotiable in a wedding budget. Flowers make the photographs pretty, and the photographer makes the flowers (and you!) look good. One cannot exist without the other. But with flowers and decorations costing an average $2,534 and the photographer and videographer totalling a whopping $4,778, these are definitely some of the bigger line items in the average wedding budget. If you’re looking to save, you should definitely try DIY-ing your decorations with flowers from Costco and a little help from your family on the big day. You can make some seriously beautiful arrangements out of just a few inexpensive bunches from a wholesale store. On the other hand, photographers are a “you get what you pay for” expense. Be careful not to hire a phony photographer — the day will fly by and you’ll cherish good quality photos of what went on while you were busy schmoozing with your guests and dancing the night away. The little things add up quickly, too. But with a little resourcefulness, you definitely won’t have to start your new life together in debt from a one day celebration. If you’re still a ways out from your wedding, consider starting a wedding savings account (yep, even if you’re single) so you’re prepared when the day finally comes. Also, check out this list of 101 smart ways to save thousands on your dream wedding, and make sure that you’re taking advantage of all the wedding freebies offered along the way. If you’re still worried about individual costs adding up, think about having a “tiny wedding.” It’s sort of like an all-inclusive elopement, but you can bring a few guests along to share your special day. Your Turn: How much did your wedding cost?